Please wear a black armband tomorrow, 09/25/12, to protest the poisoning of Cleve Foster by the government of the state of Texas for the 2002 murders of Rachel Urnosky and Nyanuer “Mary” Pal. 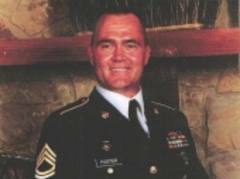 Cleve Foster is a Desert Storm veteran and has since recruited for the Army. He maintains, and the evidence does not contradict, that his co-defendant, Sheldon Ward, is the real shooter in this crime. Overriding that, however, is the fact that Mr. Foster received inadequate counsel at trial, failing to secure his constitutional right to a fair trial. Texas must stay this execution to allow its legal proceedings to catch up to the laws of the United States of America and the demands of justice. Cleve Foster was poisoned to death on 09/25/12 by the government of the state of Texas.